Beautiful 18' catboat, gaff rigged, in excellent condition. Brightwork, hull, deck and bottom have been well maintained and rudder is brand new (John Hammond Boat Repair, Spring 2018). Boat is fully equipped, includes trailer and reliable 6hp Yamaha electric-start outboard, as well as an array of boating accessories, including a new compass. "Stray Cat" is ready for new adventures. Call us soon to set up a time to see this terrific boat. Beautifully maintained freshwater Catalina 320, fully-battened main with Dutchman lazy-jacks, furling 150 genoa, and asymmetrical gen-naker with sock, powered by a reliable 27hp Perkins diesel, VC17 bottompaint. Very nicely equipped for weekends or cruising, comfortably sleeps six, refrigeration, stove/oven, hot/cold water, head and cockpit shower, dodger & sun/rain tarps, swim ladder off stern platform. Always professionally serviced, and shrink-wrapped in winter. Steel storage cradle included. ​Click here for detailed listing. Very spacious cruising sailboat, terrific layout below with double berth aft. Main sail and 135 genoa on roller furler. Universal 25hp diesel engine, updated electricals, newer VHF, FM antenna, DVD player, connection for handheld Garmin GPS at helm. Steel storage cradle included in sale. THIS BOAT IS PRICED TO SELL! Nicely appointed cruising sailboat, 6’ headroom below with beautiful wood interior. Sailed and moored on Lake Champlain only. Shallow draft (3’11”) fin keel, Yanmar 2GM diesel engine, wheel steering. Johnson sails - main with 2 reefs, jib, genoa, storm. Split stern rail with swim ladder. Wheel steering, depth, compass, VHF, bilge pumps, solar vent, anchors. Steel storage cradle included in sale (marina's hydraulic trailer in photo). 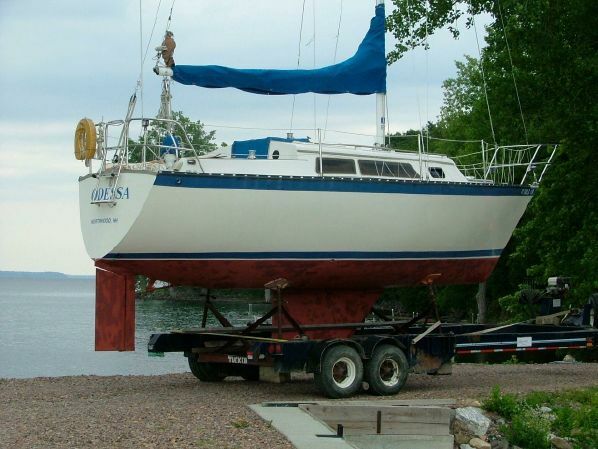 S2 26' (1983) - $6000 - NEW PRICE TO GET SAILING NEXT SUMMER - Comfortable cruising, sleeps 4+. Great sailor with tiller steering, main and hank-on jib in good condition. Full Interlux 2000 and bottompaint professionally done 3 seasons ago. Spacious layout with lots of oiled teak in cabin, private head (new head and holding tank 2014), galley with icebox and sink (alcohol stove removed), V-berth, double convertible berth in salon and under cockpit quarter berth. New (2014) 48V electric power head to sail-drive motor for easy on-and-off-the-dock motoring. Newer navy blue sunbrella upholstery on cushions. Steel storage cradle. Perfect family weekender in ready-to-sail condition, sleeps 4-5, pop-top cabin allows 6'5' headroom at anchor, with like-new canvas/eisenglass windowed snap on cover. Sails in good shape with CDI roller furling for jib and new sun edge-cover, electric start Yamaha 9.9hp outboard (2002), new large stainless Magma grill mount on stern rail, new removable table, Raymarine speed/depth. Steel storage cradle included.